With great sunny weather forecast for the UK over the next few days, it will be a chance to eat-out in the garden and what better dish than a nice salad. 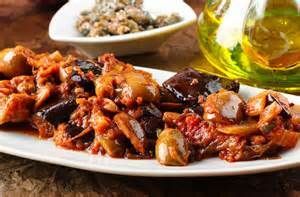 Caponata, unlike most salads actually improves if it's left to stand for a little while. 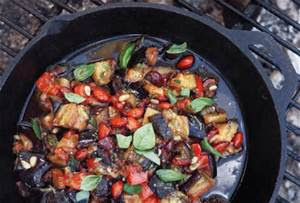 Heat the oil in a large frying pan, add the aubergine and fry until golden and soft. Remove from the pan and drain on kitchen paper. Add the onion and celery to the frying pan and fry for 6 minutes until they are soft but not brown. Add the tomatoes and cook for 3 minutes, then add the vinegar, sugar, capers, olives, parsley and some salt and pepper. Simmer for 5 minutes, then take off the heat and add the aubergines. 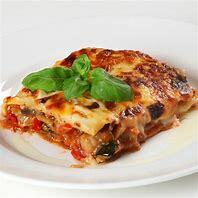 Mix well, leave to cool then serve with crusty bread and a glass of Italian white wine.